Lovely. I get a little splodge of the most anticipated Purr by pin-up girl by day and pop star by night, Katy Perry, but I can’t get my hands on a vintage Chypre de Coty? Slap a sad face on me and let’s review Purr by Katy Perry. In Bottle: Sweet peaches and a mix of florals that I’ve smelled pretty much everywhere by now. It’s a celebrity fragrance so I didn’t expect genius. Applied: Initial flair of fruitiness up top. I get mostly peaches, sweet and ripe and big with a vaguely familiar synthetic apple note tossed in there with a tiny dash of tartness slathered with a thin coating of sweetness and dipped in a hint of creaminess. That creaminess sticks with the fragrance throughout its cycle. Now the peach in Purr isn’t grown up peach like Mitsouko. Actually, I can’t imagine why anyone would think they’d get any sort of Mitsouko out of Purr so I’m not even sure why I bothered to mention this in order to discern that no, you aren’t wearing this to meet the Queen. The peach in Purr is this is fuzzy peaches candy thing. Fun and girly and not at all serious. After a few minutes the fragrance takes its fruity opening and shifts into the midstage where you’re greeted by a banal blend of jasmine and gardenia. The sweetness is still lingering there. It’s a light sweetness though, not heavy and obnoxious but nothing to phone home about either. The mid-stage blandly shuffles along, smelling pleasant enough, and hits a rose note near the end of the mid-stage’s lifespan, falling headfirst into the very predictable sandalwood and vanilla base with traces of the mid-stage florals hanging about. Extra: I don’t think Purr is anything to jump up for joy about as I didn’t expect much else from Katy Perry. Nothing to her as a person or a singer, this is just your run of the mill fruity floral celebuscent that hasn’t changed its formula since every other recent celebuscent. It’s an average fruity floral at best, with a variety of other fruity florals doing this tired fragrance genre much better justice. And as much as it pains me to say it, you’d probably get a better reaction scent from the Paris Hilton line. Me? I’ll wait and see what Lady Gaga does. Design: Purr hasn’t been released where I live yet so I haven’t handled the bottle, but I have seen photos of the bottle and I have to say it’s not my style. It really, really isn’t. The bottle is in the shape of a purple cat with a heart hanging from its collar and jeweled eyes. You take the cat’s head off to gain access to the spraying mechanism as far as I can tell. I mean, it’s cute, but way beyond my demographic. Notes: Peach, bamboo, apple, gardenia, jasmine, freesia, Bulgarian rose, vanilla orchid, white amber, sandalwood, skin musk, coconut. Purr smells like so many different generic fragrances that I don’t think anyone should really bother with it if they’re looking for that sweet fruity floral. 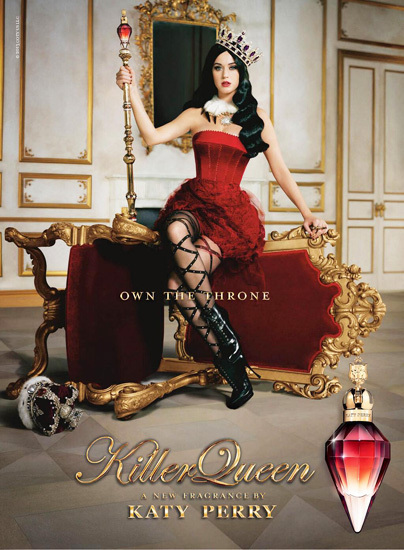 Unless you love Katy Perry’s work, her perfume is passable but highly uninteresting, and you are better off looking elsewhere for a fruity floral fragrance. Reviewed in This Post: Purr, 2010, Eau de Parfum.